Call for Pricing 868 SQ. FT. Call for Pricing 1582 SQ. FT. DIRECTIONS: Via Florida's Turnpike: Head northwest on Florida's Turnpike and then take exit 259 to merge onto I-4 E. Use the right 2 lanes to take exit 78 for Conroy Rd and then use the right 2 lanes to turn right onto Conroy Rd. 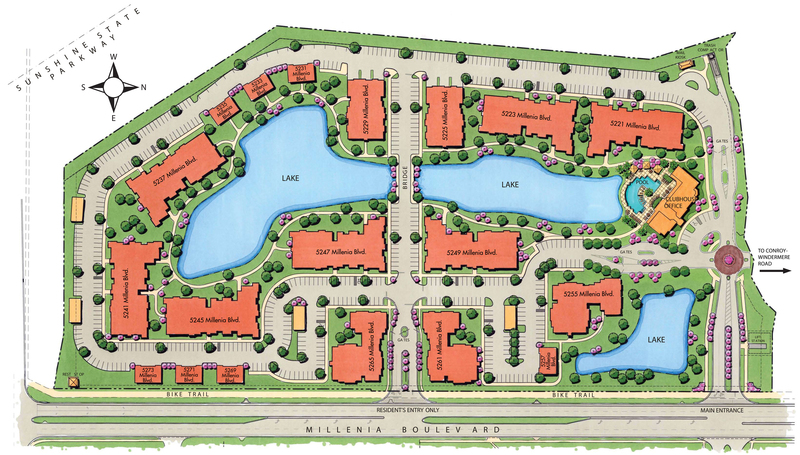 Turn right onto Millenia Blvd and the leasing office will be on your right. The Place on Millenia Boulevard Apartment Homes offers the best luxury living experience in the Millenia area of Southwest Orlando with a variety of one, two, and three bedroom layouts. Come home to an expansive apartment large enough to accommodate oversized closets and an in-unit washer & dryer. Attention to detail, like custom molding and trim and upgraded lighting, sets our apartments in Orlando apart from the rest. Enjoy luxuries like a gourmet kitchen with a breakfast bar and a beautiful bathroom with a garden tub. Not to mention, private balconies and patios overlook scenic water features. Our gated and pet-friendly community also includes amazing communal amenities such as a 24-hour fitness center, resident business center, clubroom, and a swimming pool. Our Millenia apartments in Orlando are located close to all the best dining, shopping, and entertainment that the area has to offer. The Place on Millenia Boulevard Apartment Homes are only minutes away from theme parks (most notably Universal Studios Orlando), shopping at The Mall at Millenia, and all the excitement of downtown. Our convenient location next to near Florida’s Turnpike and I-4 makes the commute that much easier. Schedule a visit today and find out why The Place on Millenia Boulevard Apartment Homes are the best apartments in Orlando!